Clean the snapper thoroughly, cut half lengthwise; remove main spine. Wash; season with salt, garlic, peppers and celery and sprinkle the inside and outside with lemon juice. Let marinate for 1 hour. Wash potatoes thoroughly, peel (if desired) and slice to thickness of 1/2 inch. 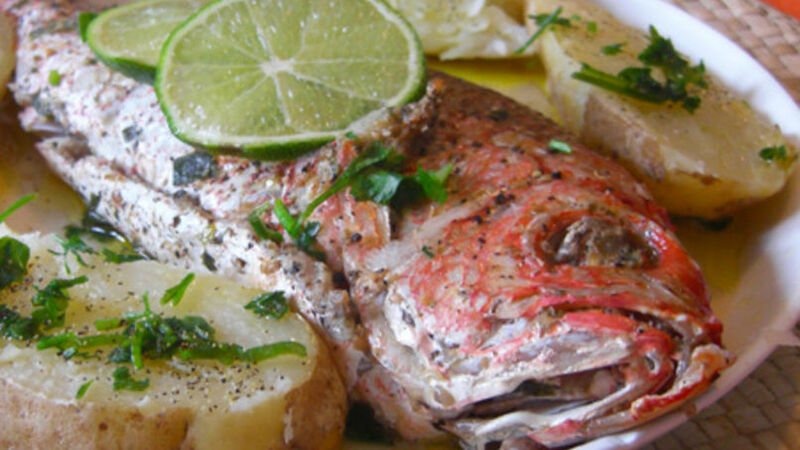 Place the snapper on a heat-resistant baking sheet and cover with the potatoes. Spread the lemon juice, parsley, oil and wine evenly. Cover with aluminum foil and put it in the oven at 350° F for 30 minutes. Remove the baking sheet from the oven and place the snapper over the bed of potatoes or you can serve it with the potatoes around it, as you wish. Make a salsa or dressing by mixing tomato, celery, sweet pepper, salt and pepper Colombian style. Heat 1 tablespoon of butter in a skillet, cook the chopped onion and sauté it with the hogao (seasoning sauce), adding the wine. Cook over medium heat for 5-8 minutes. Remove from the heat, add the bread crumbs and stir. Add salt and peppers. In another skillet, melt the remaining butter; slowly add the flour and the milk, constantly stirring with a wooden spoon until it thickens. Stuff the fish with the prepared mixture and place it in a heat-resistant baking sheet. Cover it with the white sauce and place it in the 350° F preheated oven for 30 minutes. There are endless ways to cook fresh fish; in the oven with potatoes is a delicious option that is very easy to make. The odor emitted by the mixture of olive oil and wine with spices is very pleasant. You don’t have to overdo the spices to obtain great flavor. This is a recipe that goes well with rice, salad, pepper or by itself. Enjoy!